Unique, rare, dream Fender American Deluxe Stratocaster guitar. Ltd Production run. Potential collectors piece. Woah! 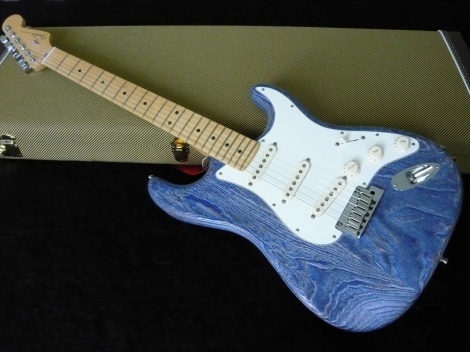 Sandblasted finish textured Ash body, Limited production run in Blue Stain. 2013 brand new, unplayed, 100% mint, not been a demo in a store, Fender American Deluxe Stratocaster - AshRare Model! Rare Colour! A true master piece! Unique! Different! I have one only!Before it was painted, it was heavily sandblasted. It has deep crevices and feels like a tattered piece of ash that's been laying in the forest for decades. This is special.